New Jersey ends a three-game losing streak with a rare win on the road. PITTSBURGH — Travis Zajac had a goal and three assists, Keith Kinkaid made 37 saves and the New Jersey Devils had little trouble in a 6-3 victory over the sluggish Pittsburgh Penguins on Monday night. 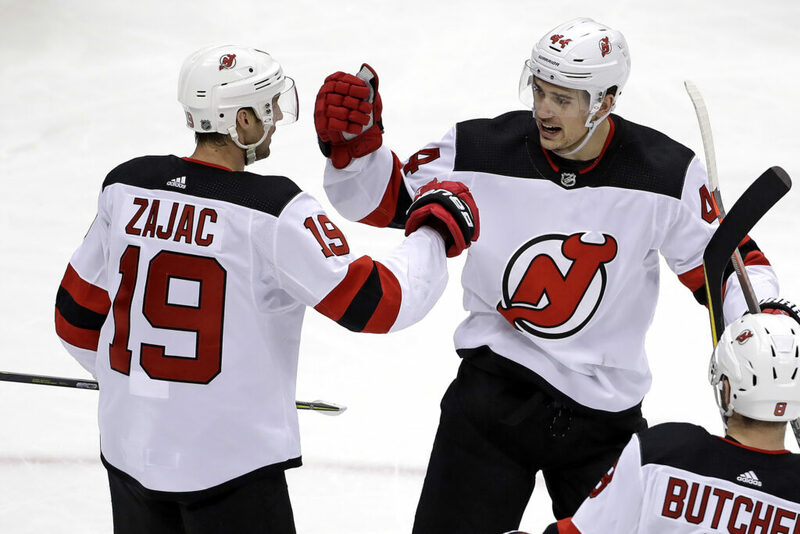 Pavel Zacha, Damon Severson, Brian Boyle, Blake Coleman and Kyle Palmieri also scored as New Jersey snapped a three-game skid. The NHL’s worst road team improved to 6-17-3 away from home. Two of those wins have come at the expense of the Penguins, who have dropped 4 of 5 overall and looked a step slow following a nine-day break. FLYERS 3, JETS 1: Phil Varone, Travis Konecny and James van Riemsdyk scored to lead host Philadelphia to its season-high fourth straight win. Carter Hart has won all four of those games in goal for the Flyers and has been a needed spark of optimism for one of the worst teams in the NHL. He stopped 31 shots and won his seventh game since his late-December call-up from the minors. TRADE: The Toronto Maple Leafs acquired defenseman Jake Muzzin from the Los Angeles Kings for a first-round pick and two prospects. Los Angeles gets forward Carl Grundstrom and the rights to unsigned defenseman Sean Durzi in the deal along with a 2019 first-rounder. The teams announced the trade Monday night, four weeks before the trade deadline. STARS: Dallas reacquired defenseman Jamie Oleksiak from the Pittsburgh Penguins in exchange for a fourth-rank draft pick.